Mud figures are small Chinese pottery figures made in the twentieth century. The figures usually represent workers, scholars, farmers, or merchants. Other pieces are trees, houses, and similar parts of the landscape. 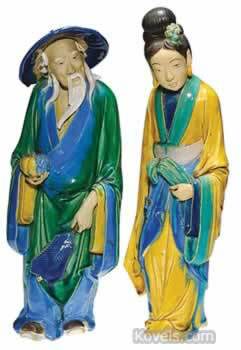 The figures have unglazed faces and hands but glazed clothing. They were originally made for fish tanks or planters. They were made by hand often by members of the village where they were made. Mud figures were of little interest and brought low prices until the 1980s. When the prices rose, reproductions appeared.